*Postpartum refers to the time of the interview – 5 to 14 months postpartum. 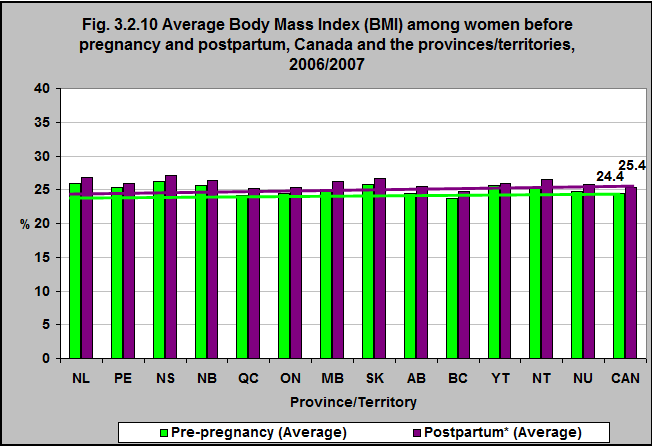 In 2006/2007, according to the Maternity Experiences Survey (MES**), prior to pregnancy the average Body Mass Index (BMI) among Canadian women was 24.4. During the postpartum period (5 to 14 months) it was 25.4. There was slight variation between provinces and territories. The average weight gain for women during pregnancy was 15.7 kg.1. The BMI categories for women 15 to 55 are: Underweight: less than 18.5; Normal: 18.5 to 24.9; Overweight: 25.0 to 29.9; Obese ≥ 301. **The MES population consisted of birth mothers 15 years of age and older who had a singleton live birth in Canada during a three-month period preceding the 2006 Canadian Census of Population and who lived with their infant at the time of data collection. Using the 2006 Canadian Census, a stratified random sample of 8,244 women estimated to be eligible was identified. Of these women, 6,421 (78%) completed a 45-minute interview at five to 14 months after the birth of their baby, conducted primarily by telephone. 1Public Health Agency of Canada, Maternity Experiences Survey, 2006-2007. http://www.phac-aspc.gc.ca/rhs-ssg/pdf/tab-eng.pdf– accessed July 21, 2017. 2Davies GAL, Maxwell C and McLeod L and the Maternal Fetal Medicine Committee of the Society of Obstetricians and Gynaecologists of Canada. JOGC 2010;239:165-173.